The Pentagon recently announced that Afghanistan is sitting on mineral wealth worth US $1 trillion—about 1,000 times the government’s annual revenue. The untapped mineral deposits, including iron, copper, cobalt, gold and lithium, a key raw material for laptop, cell phone and electric car batteries are scattered over the country. But it won’t be easy to extricate the minerals because of a weak infrastructure, strong insurgent presence, corruption in the government and remote locations of the deposits, said the military officials. 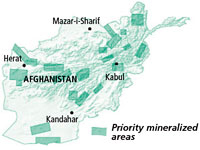 They would help the Afghan government mine and process the minerals to improcve its economy, said the Defence Department, who is leading the war against Talibans in Afghanistan. Several observers doubt the intent of the announcement because what the Pentagon stated was known since the 1980s. Some believe the announcement is designed to reverse public sentiment against war. The European Commission announced an early end to the fishing season for the lucrative but endangered bluefin tuna amid fears of the fragile stocks and confrontation between fishers and conservation groups. The commission said EU fishers have used up the entire quota halfway through the year. Countries, including France and Malta, have sought an explanation from the commission saying they are unsure if they have reached their quotas. Conservation group Greenpeace said bluefin tuna is on the brink of extinction and the commission should not have allowed fishing this year. It had stationed two ships in the Mediterranean to oppose tuna fishing boats, which led to violent clashes. A UN effort to ban international trade of the fish was foiled in March following opposition by countries led by Japan, where the fish is in high demand for sushi. Ankara shelved plans to sell Jerusalem 50 billion litres of water a year for 20 years, which would have alleviated acute water shortage in Israel. The decision was in retaliation for the May 31 killing by the Israeli navy of nine Turks aboard a Turkish-flagged ship carrying humanitarian aid to Gaza Strip. Turkish Energy and Natural Resources Minister Taner Yildiz said Ankara will not develop any joint projects with Israel until it “apologizes” for the attack. Turkey also halted a project to supply natural gas to Israel from Russia. Following international pressure, Israel on June 22 said it would allow up to 140 trucks carrying civilian goods to enter Gaza daily, relaxing the four-year blockade of the Hamas-controlled Palestine enclave. A group of Peruvians are painting the Andes white. The hope is white mountainsides would deflect heat away from the Andes range and save glaciers that are fast receding due to global warming. The team plans to whitewash over 170 acres of mountainside on three Andean peaks. Eduardo Gold, the brain behind the idea, said the paint is eco-friendly. Based on an ancient Peruvian recipe, the paint consists of lime, egg whites and water. Peru, home to over 70 per cent of the world’s tropical glaciers, has lost 22 per cent of them in the past 30 years due to global warming, according to a World Bank report of 2009. East Timor has prepared a US $3.8 billion plan to lure Australia’s petroleum giant Woodside to set up a liquified natural gas plant on the island. Woodside plans to exploit the Great Sunrise gasfield, which straddles the waters of East Timor and Australia and holds 5.13 trillion cubic feet of gas. Woodside says an onshore plant would be expensive and technically risky. East Timore insists the gas should be piped and processed onshore to establish its own petroleum industry and create the much-needed jobs for its eight-year-old economy. It also fears an off-shore platform would allow Australia grab more than its share of Timore Sea wealth. The heads of two non-profits in the US are this year’s winners of the World Food Prize for their contribution to end poverty and hunger across the world. David Beckmann, president of Bread for the World, was awarded for influencing US policies towards global hunger and poverty. 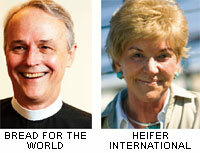 Jo Luck, the head of Heifer International, was recognized for her effort to alleviate poverty with gifts of livestock. It is the first time the award has gone to charity organizations. Just as the International Whaling Commission convened in Morocco to discuss whether to relax the 24-year-old ban on commercial whaling, a UK daily revealed Japan bribed small Pacific countries to support its whaling stance. St Kitts and Nevis, Grenada, the Marshall Islands, Kiribati, Guinea and Ivory Coast received the bribe in the form of aid, development projects and travel expenses. Japan denies the claims. The meeting aims to break the impasse between proand anti-whaling countries that often leads to bloody clashes. In May Australia filed a lawsuit against Japan at the international court of justice. Prime Minister Meles Zenawi’s ruling party won a staggering 545 of 547 votes in parliament in the May elections amid allegations that Zenawi used food aid as a political tool during the campaign. About 13 million Ethiopians—nearly one-sixth of the population—depend on food aid. A former defence minister under Zenawi told UN news agency IRIN that farmers under food-for-work schemes were not given their payments. Local government officials told them they would receive the payment after the polls, provided they did not vote for the opposition. Opposition party supporters were refused food aid. Argentine environmental activists lifted a three-year blockade on a bridge to Uruguay. They were protesting the construction of a Finnish paper mill on the banks of Uruguay river, which marks the border between the countries. They fear the mill would pollute the river and contaminate farmlands. The protestors said the bridge would remain open for 60 days within which the two governments would carry out an environmental study of the paper mill. The blockade was lifted after Argentina filed criminal and civil charges against the activists. US overturns GM alfalfa ban Biotech company Monsanto can sell the seeds of genetically modified (GM) cattle feed, alfalfa, before safety tests on them are completed, the US Supreme Court has ruled. A lower court had barred the sale of the GM seeds until an environmental impact study is carried out. The US is the world’s largest producer of alfalfa. Green groups argue the GM crop would contaminate native crops and make farmers dependent on Monsanto’s herbicide Roundup. Eleven African nations gathered in the Chadian capital on June 18 to push the proposal of creating a tree belt across North Africa. 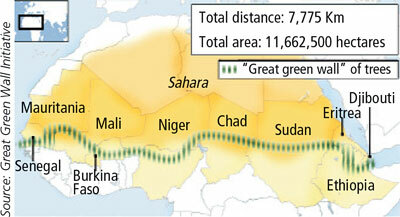 The Great Green Wall project aims to thwart the march of Sahara desert further south. “Trees will slow soil erosion and wind speed, help rainwater percolate into the ground and, thus, halt the desert,” said Chad’s environment minister Hassan Terapun. The initiative, conceived five years ago, could not start due to lack of funding. At the meeting, the Global Environment Facility, an independent financial organization, offered US $119 million to kick-start the project. According to the UN’s Intergovernmental Panel on Climate Change, in countries surrounding the Sahara climate change has slowed rainfall, resulting in desertification. If the trend continues two-thirds of Africa’s farmland may be swallowed by Saharan sands by 2025.